For those of us who have been cycling pre-Lance (or, say, soon after the introduction of pneumatic tires), it is easy to forget just how confusing and intimidating the world of road cycling can be to neophytes. From my own experience, becoming known as “the bike guy” invites a lot of people to seek advice about the sport. “The Smooth Ride,” at just under an hour in length, offers a well-produced and interesting presentation providing the kind of answers people considering the sport/pastime/totally-absorbing lifestyle would seek. I showed the DVD to my better half, who has finally begun to do some more serious riding, and she found it enlightening and, frankly, better than listening to me. Filmed on location in exactly the kind of places you would want to ride—Lombardy, the Napa Valley, Annecy, Alberta—Alex Stieda and friends cover the basics, from working with a bike shop and getting the proper fit to riding techniques (although descending and turning seem to have been combined into one skill) to where to ride. The group he has put together is quite impressive. For example, Olympic gold medallist Lori-Ann Muenzer explains proper pedalling dynamics. Kozu Shimano speaks about the pleasures of cycling, and two businessmen-turned-roadies share their experience riding the Seattle to Portland Bicycle Classic. My wife found the comments of the bike shop owner and the mechanic interesting (clarifying why I pay at my local bike shop partly in money and partly in beer) but she also liked the emphasis on safety and the section focused on women. We were not entirely clear on that market for the DVD, although it obviously would be a useful adjunct to a skills course. It presupposes that the viewer wants to get a road bike and use it properly, although other types of cycling are touched upon. For athletes seeking to cross-train or change sports, or businesspeople wanting to get into cycling, it would be more attractive than for people not yet certain if they want one of those skinny-tire bikes. Although the back cover suggests that the DVD explains “the universe of cycling,” nobody mentions the importance of cycling clubs, for example, as a way to develop better riders. Perhaps bike shops could offer the DVD on loan to prospective customers considering a road bike, or cyclists hoping to encourage non-cycling friends or partners could give the DVD as a gift, but with the wealth of information out there in our Digital World, would most non-cyclists, or hesitant beginners, pay for a DVD covering the basics? How often would they watch it? That said, we liked the DVD. It is a professional production and not only are the likeable Mr. Stieda and his friends knowledgeable and enthusiastic, but they are pretty convincing in conveying the pleasures of road cycling—everyone seems to be having fun! 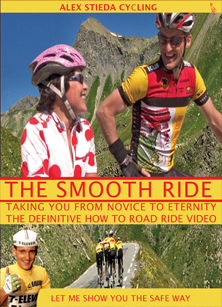 “The Smooth Ride” is available at www.thesmoothride.net. It costs C$29.95, plus S&H, and is in the NTSC format, playable worldwide. 55 minutes in length.